Arthur was born in Thatcham in early 1897, the eldest child of Arthur Adam Beaver and his wife Frances Emma (née Green). Arthur senior described his occupation as ‘blacksmith’ in 1901 but had changed to become a ‘hot and cold water engineer’ by 1911. A cold water supply was commonplace in towns by this time, but hot water from a tap was still a novelty reserved for the wealthier end of society. Young Arthur had left school by this time and was working with his father as a hot and cold water fitting worker. The family moved around, Arthur’s younger siblings were born in Yattendon (Muriel Frances, 1899), and Newbury (Cecil, 1903) before the family moved again to East Woodhay (1911) – where Arthur senior was remembered as a builder. When young Arthur signed up with the Army he gave his residence as Newbury. He doesn’t appear on local lists of volunteers printed in the Newbury Weekly News throughout 1915 and into early 1916. This suggests that he was probably conscripted, which would involve a period of with the Training Reserve, seemingly in the 5th Reserve Battalion - originally the 3rd/5th (Territorial) Battalion, Hampshire Regiment. This explains the two service numbers on his record: on enlistment he was given the number 30756 (allocated to the 5th Reserves), which was changed to 242592 when the Territorials were renumbered in 1917 (on or after 1 March). 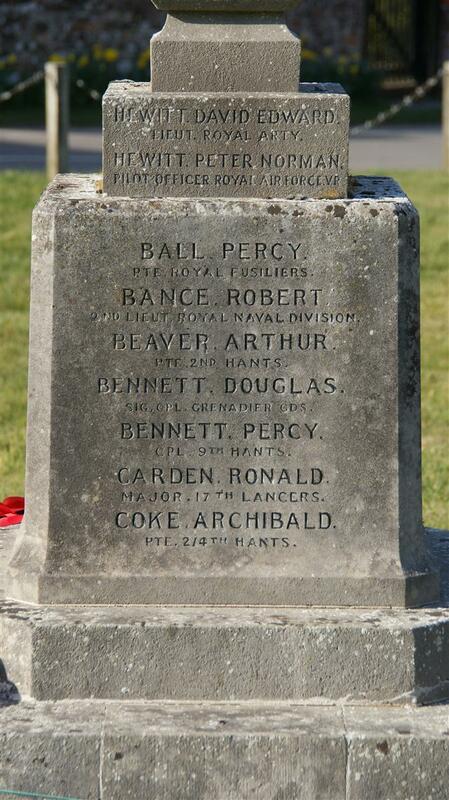 Arthur's name on the war memorial in East End, East Woodhay. He was then sent to France to serve with the 2nd Battalion, Hampshire Regiment (88th Brigade, 29th Division). It is not clear whether he arrived with the battalion in time to take part in the 3rd Battle of Ypres, where the battalion was involved in three of the sub-battles (Langemarck, Broodseinde & Poelcapelle). Langemarck (16-18 August) was the second British offensive of the overall battle, Poelcappele(7 October) the last. Even if he was not with them for the Langemarck assault the need to replace casualties sustained in this and subsequent actions may well have resulted in his trip across the Channel. The next British offensive was an attempt to capture the town of Cambrai in France. The Battle of Cambrai (20 November – 7 December 1917) was the first time the British used massed tanks, over 450 of them. The opening days were extremely successful, the tanks broke through the German defences (the Hindenburg Line) and into open country beyond. However, the Germans had developed effective anti-tank tactics, using field guns firing directly at the tanks from close range. Combined with the difficulty of supplying their advance troops this resulted in the attack petering out short of its objective. On 30 November the Germans then counter-attacked in force and pushed the British back, in most places right back to their starting position on 20 November, in some cases even further. 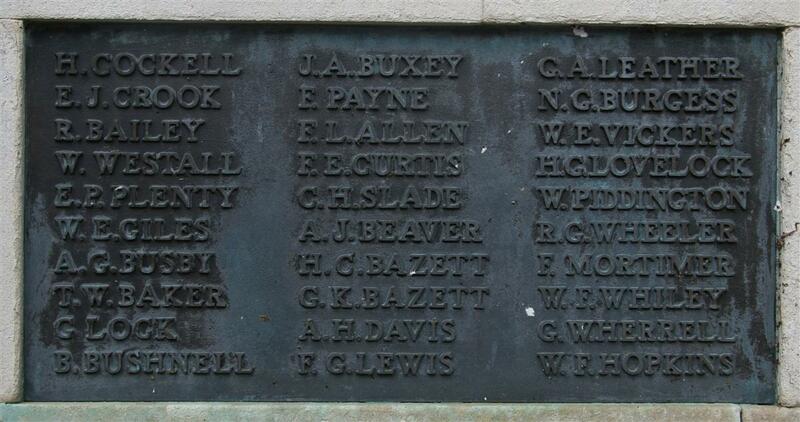 Arthur's name on the war memorial in St Martin's Church, East Woodhay. 3rd Dec Fine day. About 10.0am, enemy opened a heavy barrage all along the front, particularly on our left sub-sector and on 87th Bde in front of MARCOING and an attack was launched about 11.30am. This attack drove back the SWBs [South Wales Borderers] and W Coy to their support line, but as far as could be seen, was repulsed in front of MARCOING. W Coy and SWBs suffered heavy casualties, a great number of whom were wounded and missing. Orders were received that the Battn was to be ready to counter-attack or assist SWBs at 1.30pm. X Coy were ordered to proceed to MARCOING COPSE and consolidate themselves on edge of CANAL about b24.b.3.2 [map ref], so as to cover Lock Bridge, this they did but suffered heavy casualties on account of enemy’s barrage on the COPSE. At about 3pm the Durham Light Infantry (6th Divn) were observed in SUNKEN ROAD about L28.b.7.8 and they stated that enemy were in their lines on far side of CANAL, this was however found to be incorrect, so they were ordered to return and reoccupy their line, which they did. Orders were received about 5pm that the Battalion was to relieve the South Wales Borderers in left sub-sector of front line. This was completed by 9.30pm, and W Coy rejoined Battalion, but were then only about 20 strong. W, X & Z Coys held the front line in above order from left to right and Y Coy was in support. At about 10.15pm, further orders were received that line was to be withdrawn, as soon as bridges over CANAL had been blown up. Orders were issued to companies that they were to withdraw to line L29.b.8.0-L29.a.1.2. Two companies of 1st Essex Regt were attached to Battalion for the withdrawal, these companies had previously come up on left of Battn, when it relieved SWBs. All companies were to leave a Lewis Gun Post in the line on withdrawal and they were to withdraw at 5.15am next morning under orders of 2/Lieut W A Slater. Withdrawal was commenced at midnight and was carried out unmolested by the enemy. 6th Division also withdrew from further side of MARCOING. Considering the report that W Coy was reduced to 20 men the casualty list was surprisingly light. The Battalion had 34 offices and 873 men at the end of November so its companies should have been at a strength of 150 or more. Presumably many of the men were simply lost and straggled in over time. Nevertheless, Arthur was among those lost, missing in action. His body was never identified so he is remembered on the Cambrai Memorial to the missing of this battle. BEAVER – Reported missing December 3rd, 1917, now officially reported killed on that date, or since at the Battle of Cambrai, Arthur J, the eldest son of Mr and Mrs Beaver, of Heath End, Woodhay, aged 20 years. Locally he is remembered on Tablet 9 of the Newbury Town War Memorial as well as on memorials in the nearby village of East Woodhay, Hampshire, where his parents were living. 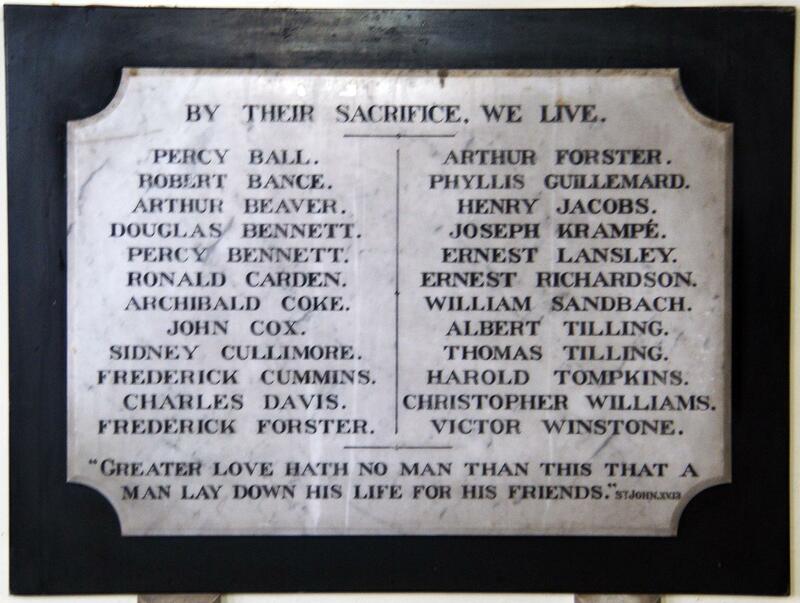 His name is on the memorials in the hamlet of East End and in the parish church of St Martin’s. He was also remembered on the memorial window in the Primitive Methodist Chapel in Bartholomew Street, Newbury. Sadly this memorial was lost when the chapel was demolished in 1962. For more on East Woodhay and WW1 download The Great War in East Woodhay by Graham Heald of East Woodhay Local History Group.